Even missing offensive ace Anya Leavell, who was felled by illness, the Coupeville High School JV girls basketball team was unstoppable Wednesday night. Ripping off the game’s first 16 points, the Wolves savaged host South Whidbey, crushing their arch-rivals 36-11 in a magnificent romp. The win, coming in the North Sound Conference opener for both teams, lifts CHS to 1-0 in league play, 2-3 overall. The Wolves have won back-to-back games, and continue to add players back to their roster, easing the loss of Leavell and defensive dynamo Kylie Chernikoff (leg injury). Freshmen Audrianna Shaw and Ella Colwell made their high school debuts Wednesday, and immediately jumped in to help their teammates on both sides of the ball. Shaw, in particular, got off to to a roaring start, filling up the stat sheet with eight points, three rebounds, two steals and a team-high four assists. Coupeville was brutally efficient on defense, throttling South Whidbey to the tune of 11-0 in the first quarter, before stretching the lead out to 24-7 by the halftime break. Coupeville ramped up the intensity, dropping a press into the defensive mix a few minutes into the game, and the flustered Falcons wilted under the pressure. King was able to give quality floor time to all 10 girls in uniform, and everyone contributed. “As substitutes came in to the game, they stepped in without much change in the effectiveness of our defense,” King said. “From Kylie (Van Velkinburgh) and Morgan (Stevens) cutting off wing and post shots to Ella and Abby (Mulholland’s) wingspans in not allowing shots around the key and Alana (Mihill) working hard up top to force the ball away from the key. “It was exciting to see the girls fight regardless of the score,” she added. 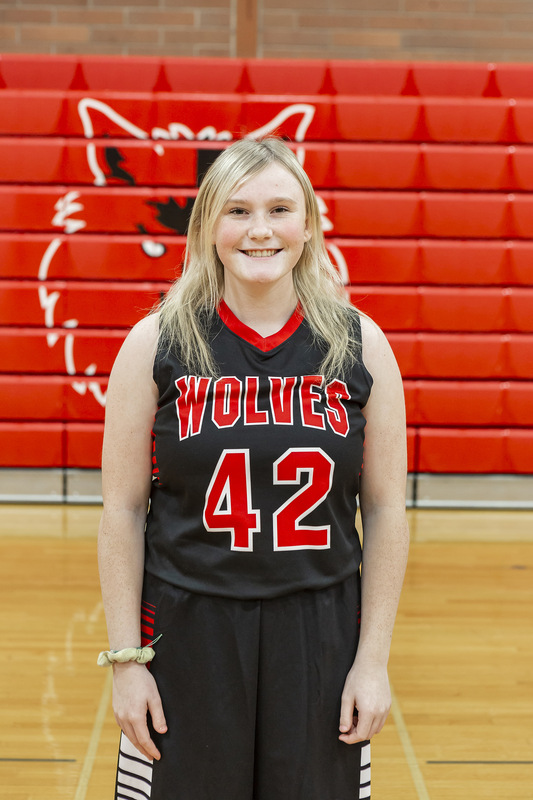 The Wolves snatched 33 rebounds and made off with 19 steals, both stats which pop off the sheet for Coupeville’s coaching staff. “It just shows the effort these girls put into the game and winning it as a team,” King said. Wells paced Coupeville with nine points, seven rebounds and three steals, while Shaw knocked down eight points, Hoskins and Mulholland each went for six and Van Velkinburgh notched four. Bailey (2) and Contreras (1) rounded out the offensive show, with Contreras also driving South Whidbey’s ball-handlers bonkers while pilfering eight steals.